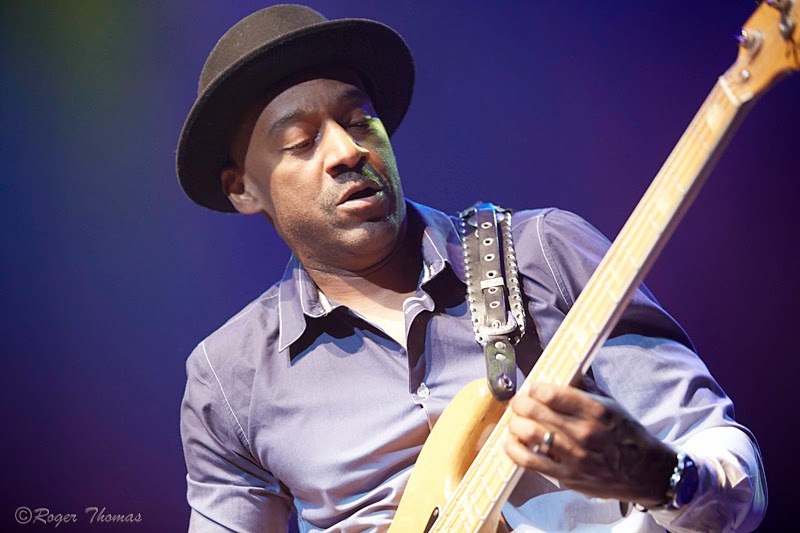 Having appeared on over 350 albums over a 37 year career with artists as diverse as Miles Davis, The Brecker Brothers, Chaka Khan and McCoy Tyner, bass legend Marcus Miller has carved out an indelible mark on both the jazz and popular music spheres. Last night he was mainly performing material from his forthcoming album, working title 'Afrodezzia', based on collaborations with musicians from Africa, South America, the Caribbean and the USA. Miller (resplendent in his ubiquitous pork pie hat) joined the stage shortly after the rest of his 8-piece band and launched in to Hylife. The African influence was immediately evident, aided by vocal contributions from Senagalese bassist and singer Alioune Wade and the Malian Kora player Cherif Soumano. The band then changed the mood completely, continuing with The Temptations' Motown classic 'Papa Was A Rollin' Stone'. Excellent solos from both Lee Hogans (trumpet) and Adam Agati (guitar) followed Miller's interpretation of the melody and what was very clear was the huge amount of interaction on stage, swapping between shadowing Hogans during his solo to orchestrating grooves with Alioune Wade. After the kora-led B's River, the band opened up considerably for Jekyll & Hyde from 2012's Renaissance. a piece of two contrasting sections, the second of which is a heavy groove that lends the backdrop to superb solos from Alex Han (sax), Agati and 22-year-old Brett Williams (piano/keyboards). The band continued in a similar vein with We Were There in tribute to George Duke. The use of an octave pedal actually made it a lot easier to hear Miller clearly (which was not the case for a disappointing amount of the gig) and his highly technical yet musical use of slap bass was wonderful to hear. Miller swapped to bass clarinet for Goree, an island off the coast of Senegal where slaves used to be kept before being sent out on slave ships. A visit to the island is what started Miller on what has become his forthcoming album and the song is written about transcending oppressive situations, particularly through music. This feeling of transcendence does indeed come across very well through the piece, building intensely under Han's soprano sax to a glorious climax. The band returned to a mroe groove based vibe for set closer Detroit before Wade and Guimba Kouyate (Guitar) returned for encore tunes Extraordinary and Blast. The first was a smoother. more down tempo affair featuring Miller on fretless bass before 'Blast' gave nearly all the members of the band a chance to solo including some trading between Miller and Adama Dembele on percussion and a fantastic bass solo by Alioune Wade which was enough to give Miller a run for his money. All in all an excellent gig of varied music with both individual and group musicianship of an extremely high level throughout. This was a fantastic gig, unfortunately there are a few accuracy discrepancies, it's Afrodezzia, Goree (Not Island of Goree), Jekyll & Hyde (No Dr or Mr) and Detroit was not performed in this set. Other than this, brilliant review. Many thanks for your input, review has been accordingly.